Gráinne is one of the premier traditional harp teachers in Ireland and the United States. She teaches at all the major summer schools in Ireland, including the annual Scoil Eigse sponsored by Comhaltas Ceoltoiri Eireann the week prior to the Fleadh Cheoil. She has done innumerable workshops throughout the United States on her annual tours, including all the major harp conferences like the Somerset Folk Harp Festiival and Irish festivals. She can teach groups of various sizes and experience levels. All workshops are taught in the traditional style, “by ear”, although written music can be provided at the end of the workshops. Participants are encouraged to bring recording devices. 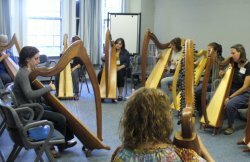 "An interesting note is that the workshop included professional harpists -- harp teachers, regular performers, the principal harpist for the Madison Symphony. I think it's a tribute to Grainne and Billy and their traditional style that musicians of this caliber come out to workshops to learn from them." Accompanying Traditional Irish Music: Some approaches to accompanying traditional Irish dance music (when playing with other instruments). The modal nature of Irish music will be discussed. Some widely used chord progressions will be explored, as well as some rhythmic patterns useful for accompanying jigs and reels. Some of the basics of 'session etiquette' will also be discussed. Aural Learning Made Easy: Do you find the idea of learning by ear daunting? Do you avoid classes that do not use written music? Come and explore different techniques and tips for aural learning, presented in the context of a simple Irish tune. And discover that it's easier than you think! Carolan & the Music of the Harper Composers: We're still playing his music more than 250 years later. Simple, elegant melodies that are as popular today as then. Learn about Carolan and the other harper bards in this hands-on workshop that will add a new piece to your repertoire. Taught by ear with written music distributed at the end of the workshop. The Collections of Edward Bunting: This workshop will include some background information on the Belfast Harpers Assembly of 1792, the collections of Edward Bunting, and their significance in preserving the 17th and 18th century harp repertoire. Some tunes from the collections will be taught, and ideas on how to adapt the published piano arrangements for harp will be discussed. From Scotland to Ireland: This workshop will explore the close musical ties between Ireland and Scotland which have existed for centuries, focusing both on the old Gaelic harping tradition of both countries and the transfer of dance tunes and songs between them. A number of Irish melodies have their origins in Scotland, or exist in different versions in both countries. A brief overview of the topic will be presented, with musical examples, and a few sample tunes will be taught. Irish Christmas Tunes: It's never too early to start preparing your Christmas repertoire! Learn to play some beautiful Christmas carols and tunes unique to the Irish tradition. Lyrics will be provided, in Irish and with translations. Tunes will be taught by ear and music given out at the end of the workshop. The Jig is Up: There's nothing that says Irish so much as the sound of a jig. Yet getting that "lilt" is a nuance that escapes many players just reading eighth notes on sheet music. Learn a jig or two from a master player and find out how to get the lightness and lift into your playing. The Music of O'Carolan: Learn a piece by Ireland's best known harper-composer. The harp repertoire of the 17th and 18th centuries will be discussed, along with some ideas for arranging these pieces. The History of the Harp in Ireland: A lecture / recital on the history of the harp in Ireland, from its earliest depictions and descriptions up to the present day. Illustrated with musical examples. Irish Slow Airs:: Anyone who has ever heard Gráinne play an Irish slow air, knows that these beautiful pieces defy written music transcription. Gráinne will take you through the fine art of interpreting and learning an Irish slow air and getting the nuances that make these pieces among the most challenging in the Irish tradition to get just right. This workshop is taught by ear and no written music will be provided. Recording devices will be your off-line memory. Irish Traditional Dance Music: An Introduction to Ornamentation and Arranging: Learn about the different types of ornamentation used in Irish music, how to play them, and how to apply them to a basic melody. Some approaches to creating interesting and stylistically appropriate arrangements will also be covered. The difference between how dance tunes are notated and how they should be played will also be discussed. Slides & Polkas & More Irish Dance Tunes: Broaden your repertoire of Irish dance tunes, with some slides, polkas, barndances and other less widely played tunes. Grainne will teach some of these easy melodies, along with some tips on appropriate ornamentation and how to add lift and rhythm through interesting accompaniment and syncopation. This workshop is ideal for both intermediate and advanced players, as the melodies are not difficult to learn but playing them up to speed can be a fun challenge! Music taught by ear, no sight-reading necessary. Concertina Workshops: For participants playing Anglo C/G concertinas. This workshop can be tailored to suit any level, from beginners upwards. It can be presented as an introduction to the instrument, for complete beginners. Or at an intermediate level, the basics of technique and style can be covered (e.g. bellows control, phrasing, alternative fingerings), as well as ornamentation in the context of Irish traditional dance tunes. As an adjunct to their concert appearances, we try to arrange workshops with Gráinne and William with the local harp community. Fees are usually arranged on a per student basis and we ask groups to have students pre-register and pay in advance for classes to ensure a basic minimum attendance.